Whether you're planning a traditional African wedding or a modern version, appropriate wedding dresses may feature beautiful colors and intricate embroidered designs. African wedding gowns are often coordinated with wedding crowns and shoes, and sometimes the groom even wears a suit that features a similar pattern and color scheme. African wedding dresses often have straight or slightly A-line skirts of varying lengths, though the most traditional dresses include a wrap skirt and top. Some are short while others reach the floor. In some cases, the dresses are two pieces and show off a section of the midriff. In others, there are two pieces (a top and a skirt) but the midriff is covered. Skirts may also flare out at the bottom in a trumpet style or even have ruffles, though they don't always have any embellishments at all aside from designs done in a contrasting color. Top styles can vary and include halters, strapless, sweetheart necklines, sleeveless, long flared sleeves, and more. Bridal crowns are popular in African wedding attire. They tend to feature the same colors and patterns as the dress and use a Velcro closure to ensure a proper fit. If you would like to wear a veil as well, you can pair them up and wear both. 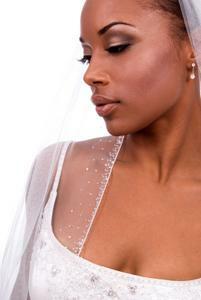 Shawls are also frequently seen with traditional African bridal dresses. When shopping for an African wedding gown, you'll often see a selection of coordinating shoes. They tend to be just as richly colored and elegant in appearance as the dresses. There are often coordinating suits for the groom to wear, so the color accents and patterns match up. What better way to symbolize your new status as one than to have complementing wedding attire? You'll give off a unified vibe as a couple from day one. If you are interested in wearing a traditional style African wedding dress and you enjoy splashes of color in wedding dresses, these dresses are worth investigating. Top them off with a crown for an elegant, regal look. If you're torn between mainstream and African style wedding dresses, there are beautiful hybrids out there, as well. The details blend into the white fabric of the dress more delicately. Don't be afraid to accessorize with color; jewel toned shoes, a veil, a train, or colorful embroidery will help you get the look you want to achieve on your big day. Just always be sure to put everything together well in advance so you have the perfect fit and you know that your accessories coordinate effortlessly with your dress.